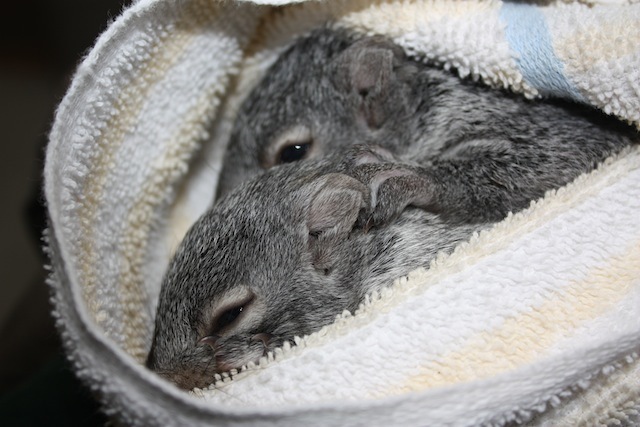 A pair of rescued baby Gray Squirrels were recently brought into the nature center after the tree holding their nest was felled. 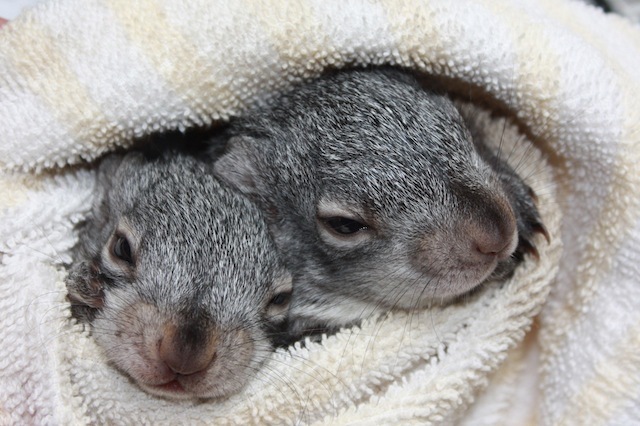 These two were the only survivors and made it up to our local rehabber, who has an outdoor squirrel learning cage for just such critters. It’s really a good thing that rodents tend to be bitey and spicey-tempered, and that they poop everywhere, because otherwise these two would have come home with me in an instant. Maybe you’ve already seen this, but it seriously made me laugh so hard I almost peed my pants. Enjoy. Happy Sunday! Fun photo for the day! 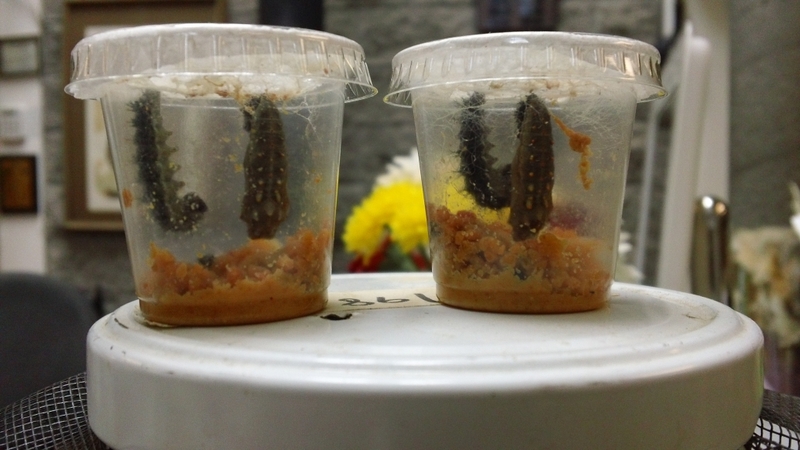 We ordered these Painted Lady caterpillars from Carolina Biological Supply and they are currently in the process of transforming into chrysalis form. The caterpillars come in these little tubs full of food (that yellow stuff) and after only a few weeks, they climb to the lids, suspend themselves from the paper towel, and begin to metamorphose. So cool! Today, I feel like celebrating the Northern Goshawk (Accipiter gentilis), mostly because I found this amazing video of a gloved goshawk maneuvering through tight spaces slowed down 40 times. Goshawks are Accipiters, a type of hawk designed for fast, fighter-pilot flight and maneuverability. Accipiters don’t soar and spin in the skies the way their cousins, the Buteos (think Red Tailed Hawk), do. Instead, they use their lean body shape, long tails, and shorter, rounded wings to move quickly through the brush after small mammals and other birds. Cooper’s Hawks and Sharp-Shinned Hawks are often seen around bird feeders, hunting the songbirds that come to eat there. Goshawks are found in the Northern Hemisphere and prefer dense forest. Cooper’s and Sharpies will hang out in less-dense forests or around meadow edges, but Goshawks love old growth. They will fiercely defend their nests by air-bombing any perceived threats, including humans. In fact, this is the only way many people get to see one! Check out this vid. It gave me that “I heart nature” fluttery feeling for the day. I used to be an avid quote collector but gave up this hobby years ago when I realized there was nothing I could do with quotes besides fill journals with them. Quotes are also more powerful when you happen across them, and there have been several floating in my head lately. Have any to add? Drop them in the comments! When I lived next to the Chesapeake Bay, there came a point in April where there was no going back; there may be chilly days and plenty of rain, but you could rest assured knowing that snow was another seven months away and your gardens wouldn’t succumb to a freezing night. Where I live now, there’s no such thing as a line between winter and spring. Yesterday we had nearly two inches of snow on the ground in the morning. It melted off by the afternoon, but the day was still cold unless you had the chance to stand in direct sun during a brief moment when the wind wasn’t blowing. If any of you follow me on Twitter, you’ve read my griping all winter about how I ache for heat and sunshine. Even though we can get snow at any time of year, what quickens my little naturalist heart is the fact that despite the cold temperatures, the world here is still rousing itself for the shifting of the seasons. Today, I just felt like listing a few of those signs, because if I – and you – stop for just a moment to watch, listen, and feel, your whole day can change. We’re so used to ignoring our natural rhythms that we forget to be a part of the wild, so even just ten seconds a day can reconnect you and ground you. …the Pacific Chorus Frogs (Pseudacris regilla) spend a portion of the day croaking. There are three males in the tank and one female (poor girl looks tired), but only one usually does the croaking. They’re so incredibly loud you wouldn’t believe such a noise could come out of such a tiny body! They’re also moving around the tank whereas they didn’t do a lot of moving during the winter, just staying hunkered down instead. Image with permission by Mike Bernard from mister-toad.com – please, please, PLEASE check out this amazing site, especially the page of Chorus Frog info (click the image to get there). There are amazing photos of frogs (my two favorites include a misguided frog trying to mate with a newt and a frog being eaten by a giant water bug!) and sound clips of the frogs to listen to. Phenomenal site! 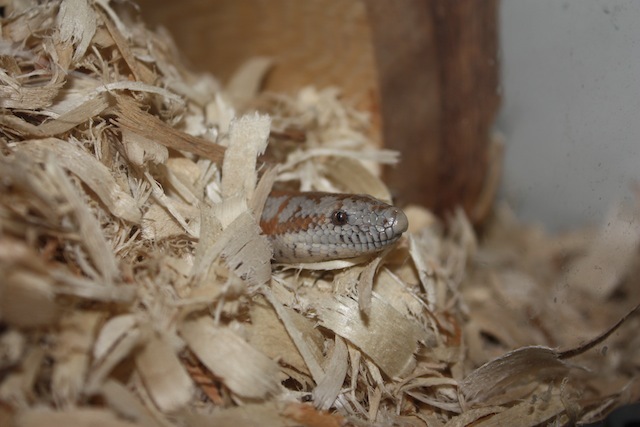 …the Western Skink (Eumeces skiltonianus) has come out of hiding; he stays buried beneath the substrate for most of the winter and doesn’t eat any of the crickets offered to him. He’s now basking his little black and blue body, flicking his tongue out to taste the air, and chases down crickets like a mad thing before devouring them. …the Gopher Snake (Pituophis catenifer) suddenly has an appetite again. This animal can go nine months without eating, despite the heat and light we keep in the tank year-long. It’s a beautiful testament that all of the reptiles and amphibians here have a natural, ingrained cycle that all the false environment in the world can’t take away. Which tells me that we do, too, no matter how hard we try to ignore it. …the Long-Toed Salamanders (Ambystoma macrodactylum) have risen to the surface of the tank. This may not sound like much, but I never get to see them throughout the winter, as they’re always buried in the soil. This time of year, however, when I lift their water dishes to change out the water, they’re right there beneath them, and they eat voraciously too. 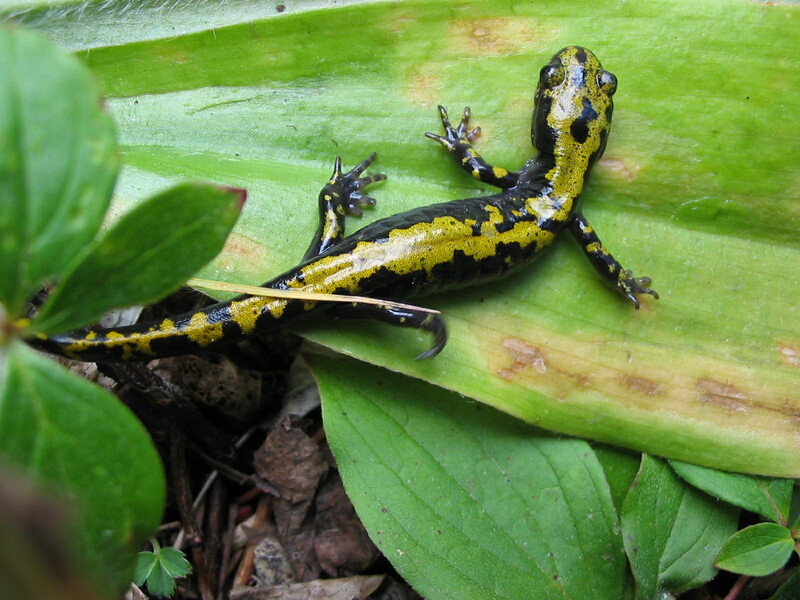 Long-Toed Salamander with its aposematic coloration. Image via Wiki, by Thompsma. 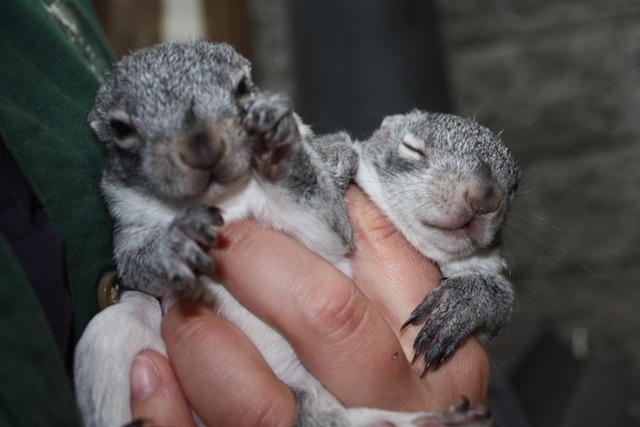 …the Chickarees (also known as Douglas or Pine Squirrels, Tamiasciurus douglasii) are in a state of complete hyperactivity. One in particular has claimed our Nature Center as his very own. Not only does he chase Gray Squirrels three times his size away from the bird feeders, he manages to get inside some of our outdoor buildings and pilfers items. He’s known for stealing insulation, paper towels, and once I even watched from a window as he attempted to stuff his face full of mop-head fibers – still connected to the mop – and make off with the whole thing. It proved too large for him to handle, so he quit, but sliced fibers were found in his nest (the place where all of the stolen items end up). If our head of maintenance makes the mistake of leaving his lunchbox open in the shop, the squirrel also makes off with baggies of peanuts and Doritos. This squirrel is so tenacious that he squeezes inside of our squirrel-proof bird feeders (ha) to eat the delicious sunflower seed, already hulled for his convenience. He and I had a battle last year where I’d run outside when he was in there to yell like a maniac or squirt him with water. He was utterly undaunted and if he bothered running off, he came back mere moments later. I eventually gave up, and he’s now earned my undying respect and admiration. Visitors often ask if he’s “supposed to be in there?” when they see him in the bird feeder. My answer is, without a doubt, yes. Chickaree, photo by Karen Dingerson at Critterzone. 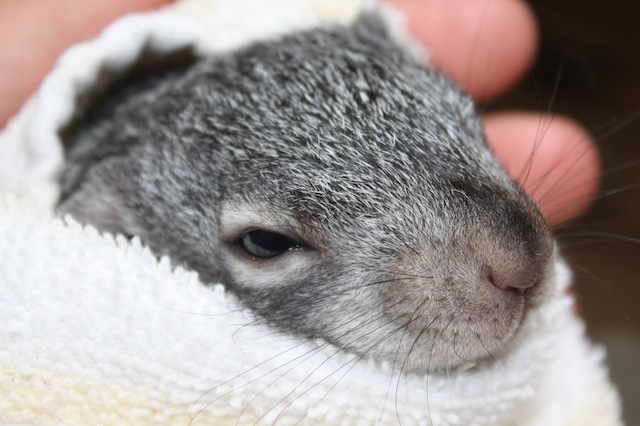 Naughty embodied in a squirrel suit. …the Canada Geese (Branta canadensis) – which are not called Canadian Geese – make an unholy ruckus every day. The chase each other, battle it out on water and land, and even spar on our rooftops, scaring the bejesus out of our administrative ladies as they think someone’s trying to break into the building. They stand up there and honk at each other or at us. Ah, mating season. …this morning as I walked down the path to the Nature Center building, a little Mountain Chickadee (Poecile gambeli) landed on the entrance of a nesting box that I’ve never seen anything use, with a huge hunk of moss in its beak. It eyed me for a moment before disappearing inside, and I hope hope hope HOPE she makes a little family this year! …the swallows are back! I’m not going to list any scientific names because, truth be told, I have no idea what kind of swallows they are, but they’re out there darting over the water after insects. They’re absolutely amazing in that there could be a dozen of them in one small area, and they swoop and maneuver around each other without colliding. 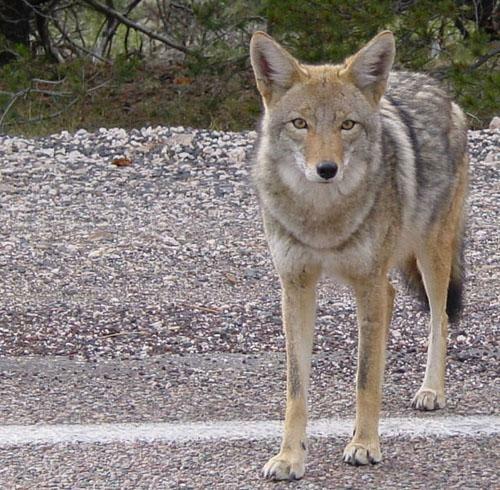 …the coyotes (Canis latrans) are back in action. They’ve been spotted a number of times close by the Nature Center in the early mornings, and we hear them yipping to each other as they hunt. Visitors are reporting them as well, and there’s something just really magical about wild dog cousins out roaming around, looking for voles and emerging squirrels. Image via Wiki, by marya (emdot). 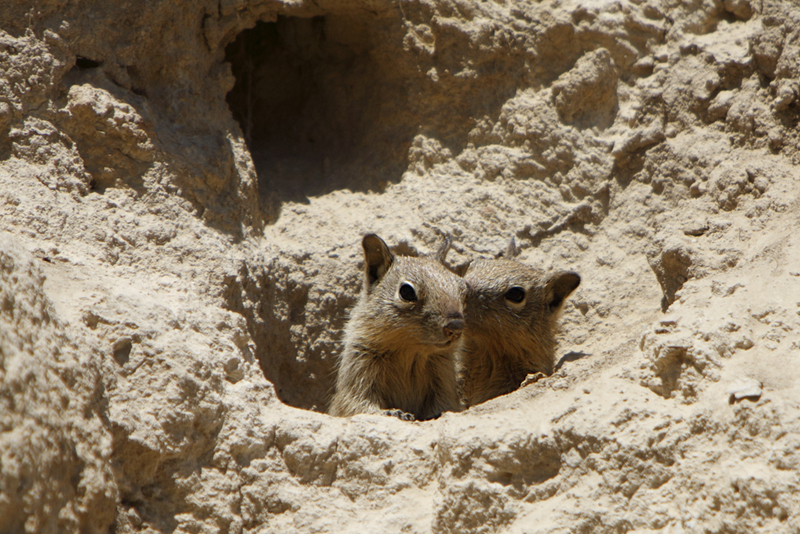 …the Belding’s Ground Squirrels (Urocitellus beldingi) have come out of hibernation and have returned to a system of tunnels behind our administrative building, hopefully to raise another family. 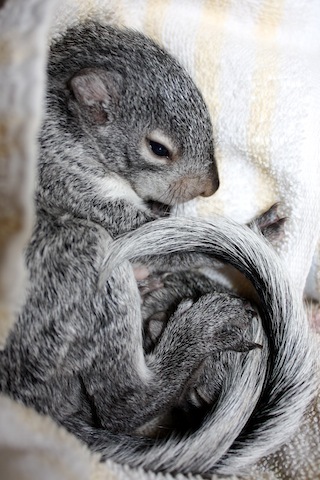 Last year we were privileged enough to watch through a window as baby squirrels emerged from the sandy tunnels to practice climbing and playing and to sun themselves in the summer heat. Talk about cute-overload. They fell down a lot. GOO. Baby Belding’s. Image via Wiki, by Alan Vernon. So far, the hummingbirds and the otters haven’t shown up yet but as you can imagine, I eagerly await their arrivals. I listen each day for the distinctive buzzing of hummingbird wings so I can get the feeders out, and keep an eye on the lake for the sinewy, graceful lines of swimming mustelids. In the plant world, the manzanita (Arctostaphylos) has beautiful hot-pink flowers hanging from beneath its leaves already, and the tiniest tips of fireweed (Epilobium angustifolium) are poking out of the ground where I planted one last year. Soon the Ponderosas will start smelling sweet! Image via Wiki, by kallerna. Beaaaauuutiful fireweed in full bloom. I am so, so fortunate to experience all of these things each day, and I want you to know that you can experience them too. This world is just outside your door, even if it’s only in the microcosm of the cracks in the sidewalk where dandelions and ants are the predominant species. What are the signs of spring where you are? I would love you to leave a comment sharing the things you’re noticing about the changing of plants and animals as the seasons shift in your part of the world. Thanks for reading!